The idea of ​​introducing e-learning in Libya began in 2007. Six schools were selected to implement the pilot project, but the idea stopped there. In 2009, the Ministry of Education contracted the Irish Riverdeep Interactive Ltd., but the project was neither stopped nor completed and remained unchanged until the 2011 revolution. The e-learning project is based on converting basic and secondary school curricula into a source formula that can be easily edited, as opposed to non-editable PDFs, and then linking these electronically to school-based tablet PCs and smart boards. This allows students, teachers, and parents to deal with the curriculum, which includes, in addition to written lessons, interactive lessons and tests. It also aims to link schools to a data center with the Ministry of Education. The 2016 Audit Bureau report mentioned that since its inception in 2006, the e-learning project has not had a clear vision, and because of overlapping jurisdictions, it has lost its objectives. The project has cost the public treasury large amounts, with over $ 100 million incurred by the Ministry. The report also listed details of violations described as “massive” in the contract with the implementing Irish company. The report indicated that in 2009, the Ministry contracted with Riverdeep Interactive Learning to implement the project in 4,000 schools with a total value of $ 58,280,000. An irrevocable documentary credit of $ 41,110,000 was opened for the company, but no work was completed on the ground. Adel Jumaa, Undersecretary of the Ministry of Education in the Government of National Accord (GNA), mentions that the statements of the Audit Bureau were not accurate and what has been spent so far from the total value of 58 million is only 14 million. Software works were implemented in Libya, he says, without incurring additional costs. However, he asserts that his ministry received the work after the disbursement of the amount and there were no tangible results justifying how these funds were spent, where some works were carried out by 15-20%. 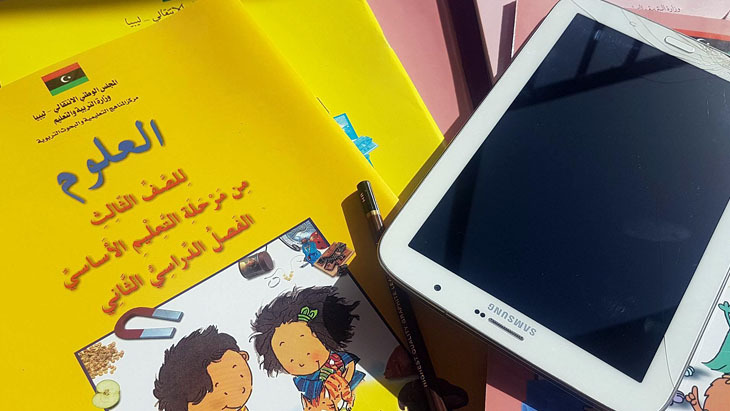 The GNA Ministry of Education resumed the Libyan e-learning project after it made an amendment to the contract signed in late 2013, but the National Salvation Government stopped the project with its amendments. “There were suspicions of corruption and dissatisfaction with how the project was stopped. The Audit Bureau stopped it until making a reasonable assessment,” Juma explains why the project had stopped during all previous governments. The Director of Information and Documentation Department at the Ministry of Education, Youssef Bou Zwideh, presents the details of the plan to be submitted to resume the project. After converting books into source and then interactive books, the technology will be initiated in Libya. It will be applied in the educational institutions and linked to the Ministry of Education data center through the educational management system, which links students, teachers and parents and connects smart schools to this center. The parts of the project for both student and teacher are operated through the smart board, labs or tablets. Bou Zwideh attributes the project’s repeated stopping to the lack of real communication between the company and the ministry in the past, in addition to the “ambiguity of some points,” denying that the infrastructure is an obstacle to its implementation. In remote areas not connected to the Viper Wire, a device storing the project data will be connected to the Sim cards in phones that provide internet connection to update the data automatically. “This device can work in all far and remote areas,” the Director of Information and Documentation Department asserts. The exams included in the e-learning program are only designed for students to study and are not related to the final assessment examinations at the end of the year. The curriculum will be developed into interactive lessons, such as scientific experiments. Video and audio recordings will also be introduced. According to the Ministry of Education, a main outcome of the project, in addition to saving time and effort in modifying and developing the curricula, will be creating an interaction between student, teacher and the curriculum to shift to the deductive method instead of indoctrination, through videos, illustrative flash or audio clips. After completing the lesson, students will be able to enter numbers and study and test themselves. Aladdin Al-Mansouri, a researcher and activist in the use of technology in education, believes that the e-learning project has stumbled due to “the lack of human resources of technical educational qualifications”. This allowed applied disciplined graduates to take leadership positions despite the lack of field experience., with a focus on formal and sometimes promotional aspects. Al-Mansouri also stressed the need to focus most attention on digital content. Specialists should not use weak digital content, which does not help students to think or want to learn more, or rely on the literal translation of many imported educational products, which have good content but are not compatible with the nature of the existing educational system.